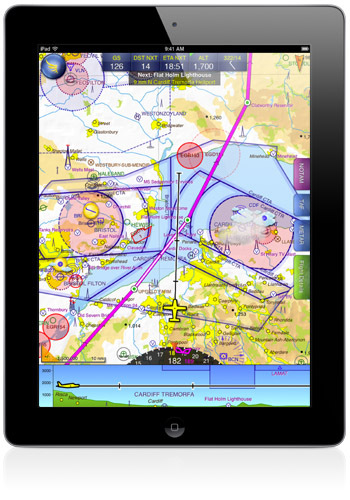 Our iOS app is a free download from the App Store, and once installed on your iPad or iPhone, requires you to enter the login and password for your SkyDemon subscription (or trial) to work. First, if you do not already have a SkyDemon subscription, sign up for a free 30 day trial. We have recorded some tutorial videos which you can watch to see most of the major features of SkyDemon in action, in both the planning and navigation phases of flight. Q. What kind of iPad do I need? iPads come in three storage sizes, all of which are more than big enough for SkyDemon: our software and charts use hardly any space. You need to either get the 3G iPad, which has its own built-in GPS receiver, or the WiFi-only model and a separate GPS receiver add-on. The first-generation iPad is no longer supported by Apple and we are therefore no longer able to support SkyDemon software running on it. Q. What kind of iPhone do I need? Any iPhone will do, from the 3GS onwards. Q. Does SkyDemon work on the iPad Mini? Yes, SkyDemon works fantastically on the iPad Mini. In fact we believe it's the very best device upon which you can run SkyDemon. Q. Which third-party GPS receivers would you recommend for the iPad? The GNS1000/2000, Garmin GLO and Dual XGPS are the three devices used most commonly for this purposes, all of which work very well with SkyDemon.